Styled with sadiki pant and torsten knit top . Tailored with silky matte satin, the Demy has a fluid silhouette that's cut to flatter. Inspired by '90s power dressing, the fit is made modern with softer, relaxed proportions. Shop the striped version here. 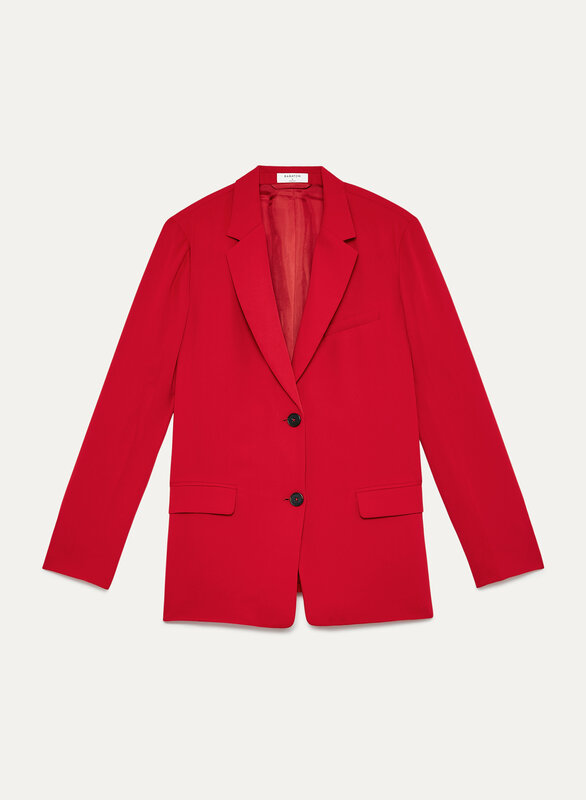 This blazer is hot - the colour is amazing and works as a statement piece with any outfit. Got in L for the oversized look. Loves it. Very nice material and delivery was very quick. Satisfied with the product as it is just as I imagined but the size does fit a little larger than expected. Overall very stylistic piece to add to the closet. This blazer is a lovely essential to have in the closet. It's made of a lightweight almost crepe like material, so it's slightly softer than most blazers. It drapes really nicely on the body as well. My only complaint is that it seems I'm between a size XXS and XS. For the XXS, the back flap stuck out oddly, and the XS fits much better, but it's a smidge too wide at the shoulders for me. It's only a slight imperfection, so I decided to keep the XS as I love the feel of this blazer.